Is The Queen’s Jubilee A Real Jubilee? Er, no, it isn’t. Not to the Christian, anyway. I bear Her Majesty no malice. Take your pick between monarchies, republics and theocracies: all have serious weaknesses which I’m not going to explore here. And yes, I shall go to our street party and enjoy myself with our friends and neighbours. But let me defend my opening. 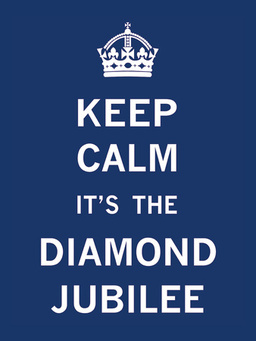 Because The Real Jubilee is so much better. Yesterday, Mark got home from school with a homework project for half-term to research The Queen’s Diamond Jubilee. All the usual stuff about what’s going to happen, what the children are going to do and so on. So he finds the official website and started typing away. “Hold on a minute,” I said, “do you know what a Jubilee originally was?” I knew he wouldn’t have a clue, and I explained simply the Old Testament origination of the fifty year intervals at which slaves were released and land returned. With the incentive that surely no other child in his class would know about this (and probably not his teacher, either) he added this to the beginning of his project. Never have I found Leviticus so useful with a child. I’ll put my name to those. And I just wonder whether, with all the talk we’ve had of churches getting involved with Diamond Jubilee Beacons we might have had a more effective witness by grass roots action for something in the spirit of a biblical jubilee. But then I’m a church leader and I’ve been far too slow to connect with what a jubilee originally was. I’m just catching up rather too late, thanks to my son’s homework. Posted on June 2, 2012, in Current Affairs, missional, Religion and tagged Diamond Jubilee, Jubilee Debt Campaign, Nick Spencer, Sally Coleman. Bookmark the permalink. 2 Comments.